Your office should have some wall space, floor space and some form of storage or display where you can pin, place and store hard copies of press releases, notes, reference material and so on. If you choose a corner of a room where the other people you live with like to come to relax, make sure there are swathes of time when you will be uninterrupted, whether this means bribing them to stay out of your way, or waiting until they are at work. Invest in a good chair. While an armchair is great for lounging in front of the television, it might not be good it sit in for endless hours bent over a laptop of sheet of paper. You don’t necessarily need a desk, but if you don’t have one, your choice of chair will be even more important. Ikea have a good range of affordable options. If possible, choose a space with a window nearby so that you will benefit from natural light as much as possible. In addition, a good lamp will aid your eyes. Try to set a pattern for your working day. You may not have to commute, but making sure you’re up, showered and dressed by 9am will help you get into work mode. Surround yourself with books, magazines and images that inspire you. 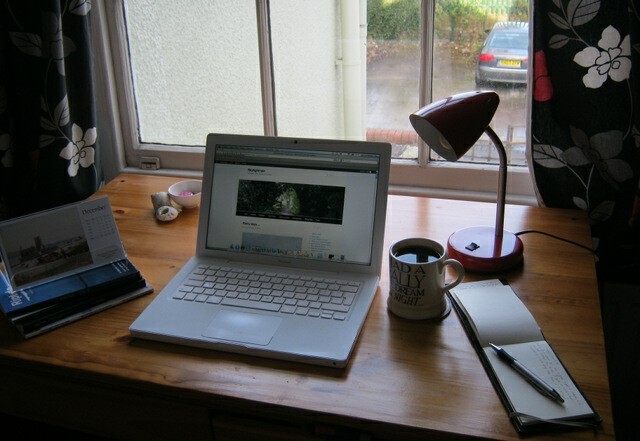 Writing can be a lonely business, and reminding yourself why you’re doing it will help to keep you motivated. The beauty of working your own hours is that if the words begin to die on the page, you can take a break. Go for a walk, slice some veggies for dinner, or run a few errands. You may not be consciously aware of it, but as you walk around you will still be working: thinking things through, straightening out tangled sentences, getting inspired. It’s all part of your job – you’re just lucky enough to be in a profession where you don’t have to sit at a desk from morning till night to produce your best work. If you have trouble motivating yourself, make sure you either choose a room without too many distractions, or choose a corner where you can work with your back to them. If you’re sitting on the sofa in front of the TV it will be all too tempting to switch it on. Some background tunes can aid the creative mind, but you may find music without words less intrusive, and less likely to break your chain of thought. You will inevitably need to get online to carry out research or get in touch with people. The most convenient way to do this is to set up a wireless broadband connection. The easiest option for this is to choose one of the many service providers who offer it as a complete package. These will invariably include a pre-configured wireless router (the device that provides the wireless functionality), so getting yourself up and running should be a very simple process – usually just requiring you to plug in the router and setting a password. This entry was posted in Writing tools and tagged home office, How To, work from home, writing room by Judy. Bookmark the permalink.